Los musicales "An American in Paris" y "Fun Home" lideran las nominaciones con 12, seguidas por "Something Rotten!" con 10, "The King and I" con 9 y "Wolf Hall Parts One & Two". 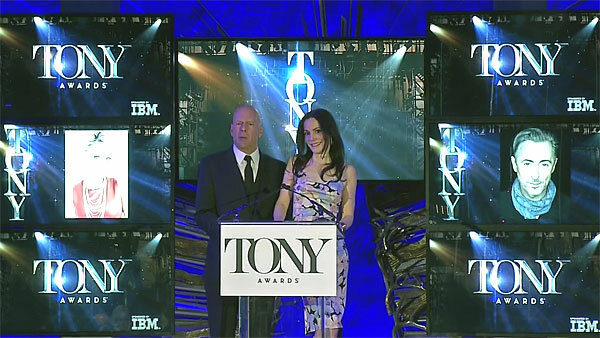 En total, 22 producciones de Broadway han sido nominadas en las distintas categorías en esta edición de los premios Tony. Steven Boyer por "Hand to God"
Bradley Cooper por "The Elephant Man"
Ben Miles por "Wolf Hall Parts One & Two"
Alex Sharp por "The Curious Incident of the Dog in the Night-Time"
Geneva Carr por "Hand to God"
Helen Mirren por "The Audience"
Elisabeth Moss por "The Heidi Chronicles"
Michael Cerveris por "Fun Home"
Robert Fairchild por "An American in Paris"
Brian d’Arcy James por "Something Rotten!" Ken Watanabe por "The King and I"
Tony Yazbeck por "On the Town"
Kristin Chenoweth por "On the Twentieth Century"
Leanne Cope por "An American in Paris"
Beth Malone por "Fun Home"
Kelli O’Hara por "The King and I"
Chita Rivera por "The Visit"
K. Todd Freeman por "Airline Highway"
Richard McCabe por "The Audience"
Alessandro Nivola por "The Elephant Man"
Nathaniel Parker por "Wolf Hall Parts One & Two"
Micah Stock por "It’s Only a Play"
Annaleigh Ashford por "You Can’t Take It with You"
Patricia Clarkson por "The Elephant Man"
Lydia Leonard por "Wolf Hall Parts One & Two"
Sarah Stiles por "Hand to God"
Julie White por "Airline Highway"
Christian Borle por "Something Rotten!" Andy Karl por "On the Twentieth Century"
Brad Oscar por "Something Rotten!" Brandon Uranowitz por "An American in Paris"
Max von Essen por "An American in Paris"
Judy Kuhn por "Fun Home"
Sydney Lucas por "Fun Home"
Ruthie Ann Miles por "The King and I"
Emily Skeggs por "Fun Home"
Marianne Elliott por "The Curious Incident of the Dog in the Night-Time"
Scott Ellis por "You Can’t Take It with You"
Jeremy Herrin por "Wolf Hall Parts One & Two"
Moritz von Stuelpnagel por " Hand to God"
Sam Gold por "Fun Home"
Casey Nicholaw por "Something Rotten!" John Rando por "On the Town"
Bartlett Sher por The King and I"
Christopher Wheeldon por "An American in Paris"
Joshua Bergasse por " On the Town"
Christopher Gattelli por "The King and I"
Scott Graham & Steven Hoggett for Frantic Assembly por "The Curious Incident of the Dog in the Night-Time"
Christopher Austin, Don Sebesky, Bill Elliott por "An American in Paris"
John Clancy por "Fun Home"
Larry Hochman por "Something Rotten!" Rob Mathes por "The Last Ship"
Bunny Christie y Finn Ross por "The Curious Incident of the Dog in the Night-Time"
Christopher Oram por "Wolf Hall Parts One & Two"
David Rockwell por "You Can’t Take It with You"
Bob Crowley y 59 Productionspor "An American in Paris"
David Rockwell por "On the Twentieth Century"
Michael Yeargan por "The King and I"
David Zinn por "Fun Home"
Bob Crowley por "The Audience"
Jane Greenwood por "You Can’t Take It with You"
David Zinn por "Airline Highway"
Gregg Barnes por "Something Rotten!" Bob Crowley por "An American in Paris"
William Ivey Long por "On the Twentieth Century"
Catherine Zuber por "The King and I"
Paule Constable por "The Curious Incident of the Dog in the Night-Time"
Paule Constable y David Plater por "Wolf Hall Parts One & Two"
Japhy Weideman por "Airline Highway"
Donald Holder por "The King and I"
Natasha Katz por "An American in Paris"
Ben Stanton por "Fun Home"
Japhy Weideman por "The Visit"